Much contemporary metaphysics, moved by an apparent necessity to take reality to consist of given beings and properties, presents us with what appear to be deep problems requiring radical changes in the common sense conception of persons and the world. Contemporary meta-ethics ignores questions about logical form and formulates questions in ways that make the possibility of correct value judgments mysterious. 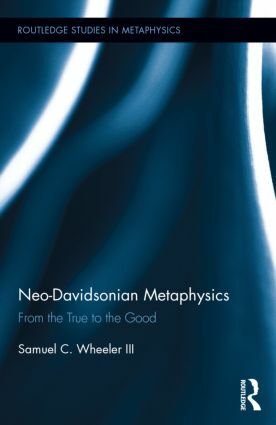 In this book, Wheeler argues that given a Davidsonian understanding of truth, predication, and interpretation, and given a relativised version of Aristotelian essentialism compatible with Davidson’s basic thinking, many metaphysical problems are not very deep. Likewise, many philosophers' claims that common sense needs to be modified are unfounded. He argues further that a proper consideration of questions of logical form clarifies and illuminates meta-ethical questions. Although the analyses and arguments he gives are often at odds with those at which Davidson arrived, they apply the central Davidsonian insights about semantics, understanding, and interpretation. Samuel C. Wheeler III is Professor of Philosophy at the University of Connecticut, USA.